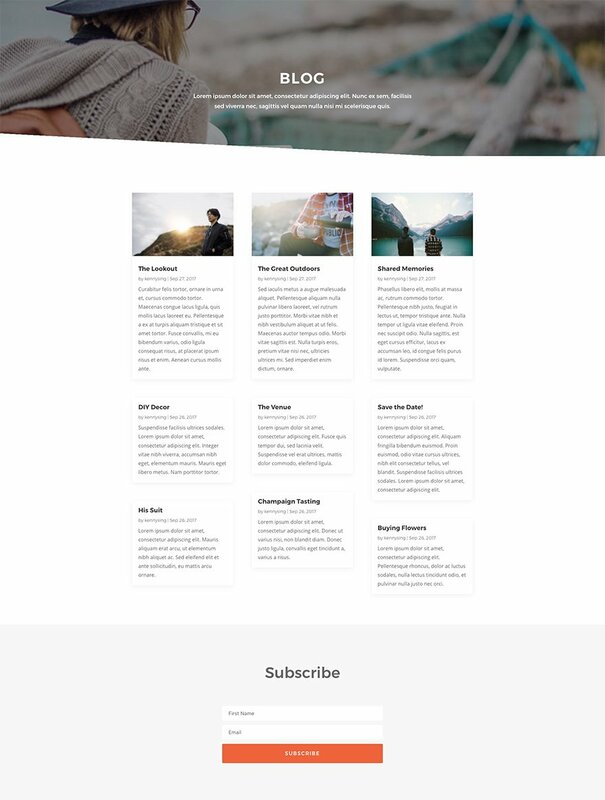 This week Kenny and his team have created a gorgeous Copywriter Layout Pack with nine different pages that provide everything your website will need to get up and running in just a few clicks. All of the layouts are unique and contain all of the elements you need to get in touch with your next clients. Besides that, there are also matching high-quality images included which you can use for all kinds of purposes. 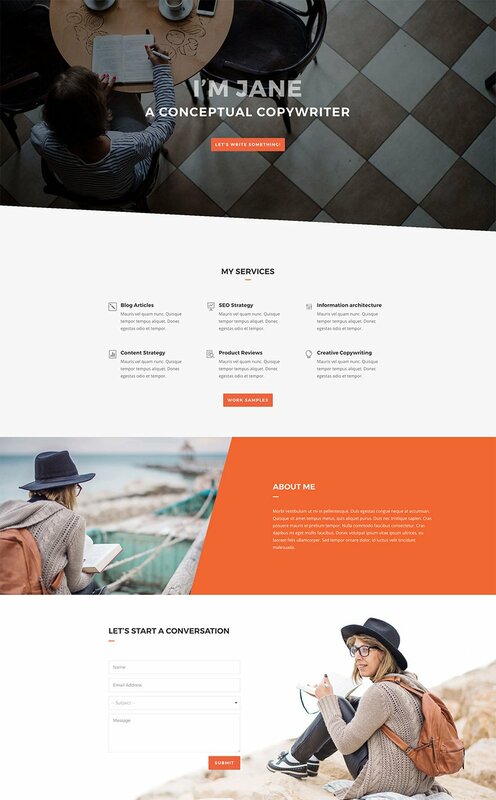 This copywriter layout pack is designed to provide you with all the necessary designs, layouts and elements your website needs. 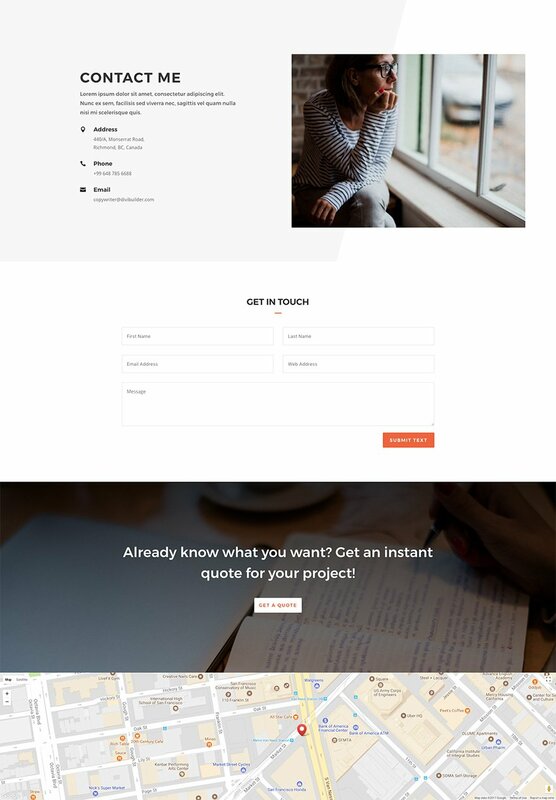 Besides having 9 unique and elaborated pages that’ll help you attract new clients in an effortless way, the copywriter layout pack also provides you with high-quality images which you can use for free and for all kinds of purposes. On top of that, the layouts within this layout pack are well-thought-out and help you save time while creating your next copywriter website. To use the Copywriter Layout Pack on your own Divi website, you will first need to download it using the button below. To gain access to the download you will need to subscribe to our Divi Daily email list by using the form below. As a new subscriber you will receive even more Divi goodness and a free Divi Layout pack every Monday! If you’re already on the list, simply enter your email address below and click download. You will not be “resubscribed” or receive extra emails. Once you have downloaded the layout pack, locate the divi-copywriter-layout-pack.zip file in your downloads folder on your computer. Double click the folder to unzip it and then navigate inside the divi-copywriter-layout-pack folder. Inside this folder you will find 9 files, each of which is a unique layout that you can import into your Divi Library. To do so, navigate in your WordPress Admin to Divi > Divi Library > Import & Export. You can select the individual layout you desire or choose the All Layouts file to important everything at once. To load one of these layouts onto your page, activate the Divi Builder and then look for the “Load From Library” icon in the page settings bar (it looks like a plus symbol). Click this icon to launch the Load From Library popup and then navigate to the Add From Library tab. Here you can choose any of the nine layouts we’ve included in this pack to add to your page. We hope you enjoy this copywriter layout pack. And to help ensure that you do, we’ll be doing a live stream on our Facebook page this Wednesday at 3pm EST to walk through what it might be like to actually use this layout for your own website instead of simply importing it and loading it up. We’ll talk header and footer design, customizer settings, converting certain sections to global, and more. FYI, this is under your Divi Resources, but not on the main blog page. I’m alway wondering where from you ET get this shiny icons and graphics ? This is a beautiful website design, but I fear it suffers from the usual Divi lack of styled archive and category pages. Surely any copywriter is going to be keen blogger! Is there anything in the pipeline for Elegant Themes to address this? 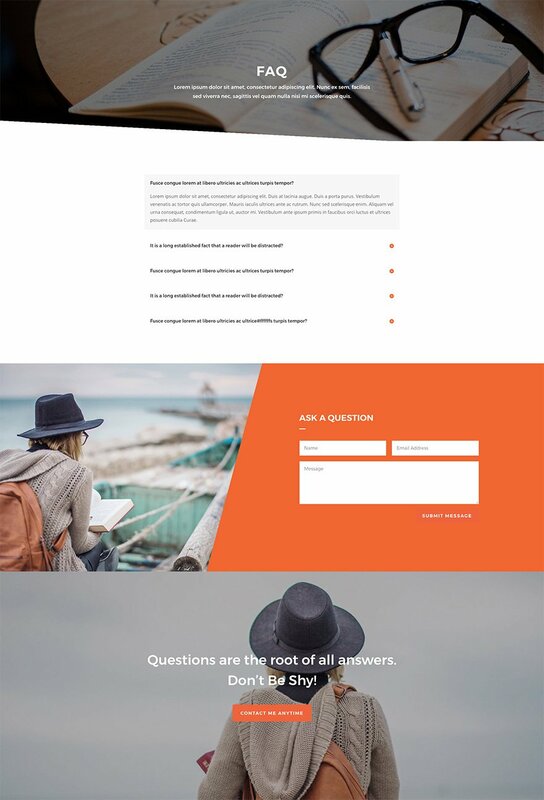 The Divi community has been asking for this for a long time now and while there are regular upgrades and new features, it seems like this has been forgotten. Oh yeah, agree with that! Archive and category pages are crucial for every blog and I don’t know really why they are left on a side track. I am a big Divi fan, but the lack of customisable archive / category / search pages is one of its main drawbacks. Please, please give us the same creative freedom with those pages as you do with blogs and other pages. We’ll love you all the more. We need custom post type, taxonomy and template for them. Yes, want this very much!!! There already was, and it works great. That’s what Extra is for. Seriously, has no one tried Extra? Same problem here. Everything looks fine but the archive pages … are not in the same quality 🙁 . Please make here a Feature Update. Nice design overall and I appreciate your making this available. What I dislike, however, is the light-gray, tiny, low-contrast font that’s used for much of the body copy. It’s very taxing on the eyes. That’s especially ironic for a site intended to showcase the value of words. Bigger, darker, more readable fonts would be far more appropriate. But again, thanks for giving Divi users a head start. Divi designers love this look of light fonts and graphics on light backgrounds, its not terribly accessible to be honest, I struggle to read them, I wonder how people with visual impairments manage? That said, there is nothing stopping us changing this ourselves, so thank you for the head start on what is a very cool design! I’m 72 with older eyes and I don’t have a problem reading the low contrast type. I COULD go a touch darker but full black and white is too stark to continue to read without creating strain. I could go up a two px in point size, however. I am a long-time print designer with an emphasis on book design, covers and interiors. So I have spent a long time with choosing fonts that make books easy to read. What I find annoying is ET’s use of Poppins in the blog. And Monteserrat as a headline font, as in this writer’s layout. Both are too extended. That is, the letter forms (with regard to the x-height sections) are too square. That is not the shape of letters I learned to read, thus my brain has to translate each word shape back to my default. And that process, even though we’re talking micro-seconds, slows down my reading and comprehension. And ANYTHING that makes reading more difficult should be avoided. As web designers, we have to remember that the POINT of what we’re doing is to get people to want to read and then to continue to read until they are finished and then think about what we’ve said and possibly encourage action. Exactly the same process as creating a poster, brochure, magazine, book. But what I see is a strong focus on pretty pictures and shiny things that move. I LOVE great design, don’t get me wrong. But not at the expense of making reading more difficult. Visuals should support the words. The exception in all this when you talking ABOUT visuals (photos, art, etc) or when you are showing a product. But you wouldn’t buy a sweater ONLY because it looks good. If it LOOKS good, THEN you will read about it to see what it’s made of, how to clean it and store it, what sizes it comes in, etc. Thus the POINT of pretty picture is to get you read about it and THEN make the decision to buy. A long rant, I know, but I have to spread the word. BTW, I NEVER use these layouts for the products they were designed for, I use them for the elements they contain and mold them into being things I want in projects I’m working on. I also get ideas, both to do and to NOT do. So, I truly appreciate them. Just please don’t use extended fonts (or excessive leading or kerning, for that matter!). Unless you really don’t care about me writing what’s on your site. Great looking well thought out layout with some very stylish touches. Bold colours and easy to read fonts. But I saw a SEO problem. H4 instead of H2 in the second part of the page. That for SEO, it’s very bad. I imagine that it can be changed, right? As always, appreciate the effort in developing new designs for me to play around with. As a copywriter myself, this one’s of particular interest. Thanks Team Divi! Nice design, can be used for any type of business really. It looks amazing again, thanks! For some time I was wondering if any of You tried to change all the colors in these recent layouts from orange to for example green ? That would be amazing. Many customers like layouts but I find myslelf changing colors over and over again. Anybody would like to share experience with CSS colors variables with Divi or any other ideas ? Thanks a ton! Thanks for the reply. What I actually meant was if it is possible to change orange colors all at once without need to change color in every single module one by one. First thing which came to my mind was CSS colors variables but didn’t give it a try yet. Ya know you can lead a horse to water but sometimes you just can’t get then to drink it. Despite those that want ET to do their work for them another nice job guys. Always enjoy checking out the layouts. We need a layout pack or child theme for job posting/search website. Are you planning to develop something to help in this aspect. Because I want to develop a website for job listing but could not find anything in ET. But I can not display the blog page layout correctly… This is the divi default page of the blog that appears… ?? I was able to download the High Res image assets without inserting my email address proving I’m a member, and I was not already logged in, was this supposed to happen? nasty plugin on my browser you left behind. Poor form. Used to like you guys. I’m afraid your comment is incomprehensible. I always love freebies. And custom post type is just awesome. Keep up the good work. This file cannot be imported. It may be caused by file_uploads being disabled in your php.ini. It may also be caused by post_max_size or/and upload_max_filesize being smaller than file selected. Please increase it or transfer more substantial data at the time.